I sculpt the vessel in clay then make a mold from plaster gauze, which I cover in handmade paper made from abaca pulp, dyed with pigments. I use layers of chalk pastels on the surface. 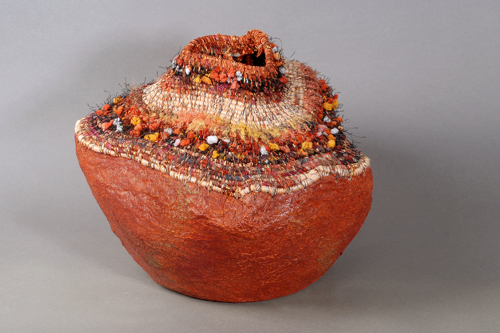 The opening is woven with cord wrapped in threads. 12 inches high x 40 inches in circumference.